Storks feeding on rubbish dumps instead of migrating are more likely to survive the winter, research shows. The bird is among a growing number of migratory species that have changed their behaviour due to human influences, says an international team. Until recently, all white storks in Europe migrated south for the winter, but now more are flying shorter distances to snack on food on dumps. The white stork breeds from Europe to north-west Africa and western Asia. White storks in Europe have traditionally flown south to spend the winter in Africa but in recent decades an increasing number have stayed closer to home, drawn to the food discarded at landfill sites. 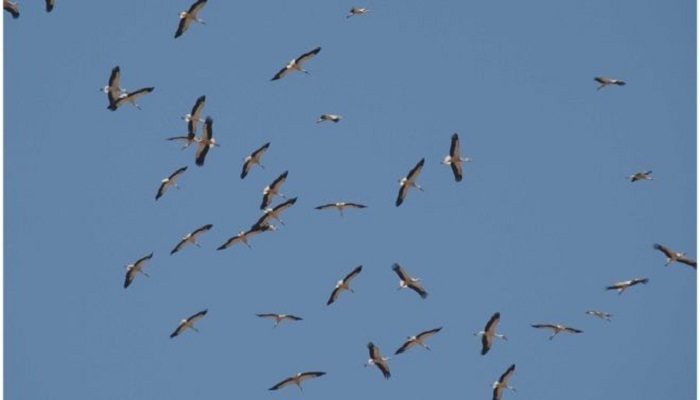 A team lead by Dr Andrea Flack of the Max Planck Institute for Ornithology in Germany used GPS devices to study the migratory habits of 70 young storks from eight different countries during their first migration. The research, published in Science Advances, tracked birds hatched in Armenia, Greece, Poland, Russia, Spain, Germany, Tunisia and Uzbekistan. The study found that storks from Russia, Poland and Greece followed the traditional migratory route of flying south as far as South Africa. However, birds from Spain, Tunisia and Germany lingered north of the Sahara; birds from Armenia flew only a short distance; and, surprisingly, birds from Uzbekistan stayed in their home country. The scientists say that most of the birds that stayed north of the Sahara survived by feeding on rubbish dumps, enabling them to obtain food without the added energy expenditure of long-distance flight. Meanwhile, the birds staying in Uzbekistan probably obtained food from fish farms, suppressing their usual migratory habit of flying to Afghanistan or Pakistan for the winter. Dr Flack said the white stork appeared to have changed its behaviour to live closer to humans where food is in good supply. "There is some sort of human impact that causes these birds to change their migration strategy," she told BBC News. "Those that stay north of the Sahara seem to have advantages from feeding on these landfill sites in Morocco. "For a white stork it's a good place; they find a lot of food there. But of course it's a risk; one wrong food and they're dead." The researchers say that while human influences such as food may be beneficial to migratory species, there could be long-term implications for the ecological roles they play. For example, storks feed on crop pests such as locust swarms in tropical Africa. White storks will consume a wide variety of prey including insects, frogs, toads, tadpoles, fish, rodents, snakes, lizards, and earthworms. And commenting on the research, Stuart Butchart from Birdlife International highlighted other aspects of human activity that had a clear detrimental impact on migratory species. "While there are other examples of migratory birds benefiting from human modifications to the environment, such as Blackcap (formerly a summer migrant in the UK) now wintering in the UK to take advantage of warmer winters and garden bird feeders, these are exceptions. "Many more migratory species are declining owing to habitat loss and degradation on their breeding, passage and wintering ranges, driven by intensifying and expanding agriculture, logging, and destruction of coastal mudflats by land reclamation, among other factors."